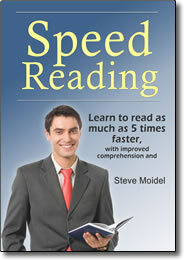 Speed Reading DVD by Steve Moidel – Free Video Clip – Discount! Reading Doesn’t Have To Be a Chore. Think about that the next time you’re slogging through a 50-page report . . . trying to crank through a jam-packed in-box . . . or wading into a pile of unread magazines and trade journals. With the surprisingly simple techniques in this program (and some practice) you can burn through your daily reading in a fraction of the time. You’ll get more useful information from what you read, too. Reading and memory expert Steve Moidel has perfected a speed reading program that can double your reading speed in minutes. With practice, you can soon be reading as much as five times faster—with improved powers of comprehension and recall. Imagine how much more you could accomplish if you could read up to FIVE times faster! With the proven techniques presented in this program (plus a little practice) you can increase your reading speed and still comprehend what you read. Speed Reading will help you streamline your reading and comprehension skills and keep them sharp for life! You’ll learn how to read more in a fraction of the time—and dramatically improve your learning powers.